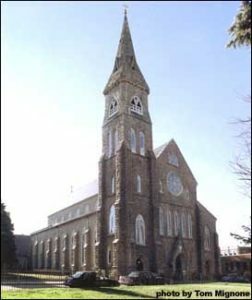 St. Mary’s Cathedral is the spiritual center of the Fall River Diocese. It is the principal church of the Diocese where the bishop has his chair – in Greek, cathedra– and where the Catholic community gathers with its bishop to celebrate the great feasts and important happenings in the life of this local church. The Cathedral is dedicated to the Blessed Virgin Mary, patroness of the diocese, under her title of Our Lady of the Assumption. Built originally to serve as a parish church, St. Mary’s was solemnly consecrated by Bishop Matthew Harkins of Providence on September 7, 1901. It became the Cathedral Church when the Fall River Diocese was created in 1904 by Pope Pius X. The cornerstone of the Cathedral was laid on August 8, 1852, by Bishop John Fitzpatrick of Boston whose jurisdiction then included all of the state of Massachusetts. A small wooden church dedicated to St. John the Baptist already stood on the site, but was too small to serve the rapidly growing parish. St. Mary’s Cathedral was designed in the Gothic style by renowned architect Patrick C. Keeley of Brooklyn and built of native granite. It was dedicated by Bishop Fitzpatrick on December 16, 1855. The steeple was completed three years later in 1858. Its spire, surmounted by a gilded cross, rises 190 feet above ground. Two chapels adjoin the Cathedral. The Lady Chapel, situated on the Second Street side of the building, was completed in 1869 and serves as a Blessed Sacrament chapel where daily Mass is offered. The Bishop’s Chapel, on the other side, was completed in 1935 and is dedicated to the English martyrs, Saints John Fisher and Thomas More. Beneath the chapel is the Bishops’ Crypt, where four bishops of Fall River are buried. The windows in the Church date back to different times. Those in the nave are the oldest. Of German origin, they were installed in 1891. 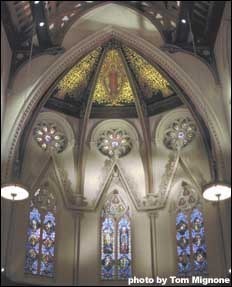 The sanctuary windows were designed in Brooklyn and installed in 1915. The three lancet windows above the choir loft, commemorating the Assumption of the Blessed Virgin Mary, were designed in Boston and installed in 1952. Over the years, the Cathedral has been beautified in five major renovations: in 1890-1891; in 1912-1913; in 1951; in 1978-79, to provide a setting for divine worship in keeping with the liturgical renewal fostered by the Second Vatican Council; and in 2000 in anticipation of the one-hundredth anniversary of the consecration of the church in 2001 and the centennial of the founding of the Diocese in 2004. Take Route 24 South Route 195 West. Take Exit 7 (Plymouth Avenue) and bear left at end of ramp. At the second set of lights, take a right onto Rodman Street. At first set of lights, take a right onto Second Street. Cathedral is on the left and parking is on the right. Take Route 195 West to Fall River. Take Exit 7 (Plymouth Avenue) and bear left at end of ramp. At the second set of lights, take a right onto Rodman Street. At first set of lights, take a right onto Second Street. Cathedral is on the left and parking is on the right. Take Route 195 East to Fall River. Take Exit 7 (Plymouth Avenue) and bear right at end of ramp. At second set of lights, take a right onto Rodman Street. At first set of lights, take a right onto Second Street. Cathedral is on the left and parking is on the right.